The dakini of Northern Europe is called falkyr [Norse] or in plural, walkdre, valkyrie [Teutonic.] She is familiar to us, if only through the Nibelungen opera-cycle by Richard Wagner (1813-1883,) especially Die Walkure which tells about Brunhilde and her karma as a valkyrie. Wagner: Act III: Ride of the Valkyries [YouTube external link.] British researchers (Oct. 2004) found this to be the single most dangerous tune to play while driving! Die Walkure Toronto, April, 2004.
synopsis of their appearance in Act III of the opera. The falkyr is the death angel who hovers over battlefields to take the spirits of warriors to the heaven called Valhalla where Wotan (Norse: Odin) reigns. Later, others of her kind greet the fallen at the great doors of Valhalla, and they also function as cup-bearers, who serve mead and feasts of pork to the valiant dead. She is also functions as a tutelary divinity who instructs young warriors in the various skills of combat. As a guardian spirit who befriends youths, she gives them initiatory names and marvelous weapons. She is sometimes regarded as a supernatural bride who teaches arts of love, as well as war. Valkyries were thought of as mounted female warriors splendidly adorned, who could venture over water and through the air. Fully armed with swords, spears and shields, they rode not only horses, but wolves or ravens, too. It was thought that the aurora borealis [Northern Lights] was the light reflected from the surface of their shields. They bore names such as Hild which means battle, Hildegard and Brunhilde. There is a tradition that says there are two kinds of valkyrie: divine ones numbering 9, or 9 times nine, and semi-human ones, the vaetter, who can be seen only by those with 'second sight'. The vaetter appear to ordinary people as the undulating play of the aurora borealis. The epic poem, Grimnismal, lists 13 valkyries -- the number of lunar months in a year; the number of witches thought to compose a coven. In fact, between the 10th and 14th centuries -- the post-conversion centuries when the remnants of pagan belief were of concern to the Church as well as to the relatively new Christian communities of northern Europe -- valkyrie and witch were used synonymously. Like all dakinis, valkyrie have terrifying aspects. She may be a blood-thirsty ogress, a giantess who appears as an omen of battle in dreams where she may be seen pouring blood over the land and devouring those in her way. In the Norse tradition that some inhabitants of the Orkney Islands (off the coast of Scotland) still can call to mind, it is valkyries who instigate the state of war by preparing a warp of spears weighted with skulls. The weft is described as formed of human entrails, and their shuttles are arrows wound with threads of blood which weave the fabric of murder known as war. Their weaving determines the outcome of battles, and as they work, they sing the Daurrudarljod. In Egypt, there were vulture-priestesses presiding at funeral rites who wore feathers, as did the Hindu heavenly beauties called apsaras. Prehistoric sculpted figures depicting bird-headed women have generally been interpreted as goddesses. This form of dakini figures in the mandala of at least one Tibetan Buddhist wrathful deity. The costume of the Wagnerian walkure above, features the typical helmet with large bird's wings. The boss of her shield is in the 8-petalled form in which each circular shape is a spiral thread. This spiral has been used since pre-historic times, and is interpreted probably quite correctly as signifying the winding continuity throughout cycles of death and rebirth. See a neo-classical drawing of a Gorgon's winged head. In skalds [Norse hymns,] the dead are referred to as hrafengrennir or raven-feeders. Though actual ravens and their counterparts, such as the vulture, feed on dead bodies, they are also traditionally associated with female divinities. Therefore, the skaldic phrase is an allusion to the valkyrie which feeds on the flesh of the dead. The Old Saxon language used widely at least until the 11th century, also calls the waelceasig [or waelcyries] corpse-eaters, and refers to them as 'man-eaters.' This ghoulish or vampiric activity appears in love ballads [see Walker] because this behaviour was thought of as beneficial - the lover who feeds on her beloved's flesh is doing so out of devotion, since he would achieve a blissful afterlife as a result. Horse-headed valkyries are also described. They resemble the mare-masked priestesses of Demeter, the Greek fertility goddess whose cult was centred in Asia Minor. In old Sweden, a mare-woman [volva] - a witch who could change form into a female horse - could carry a man away to his death, cf. nightmare. 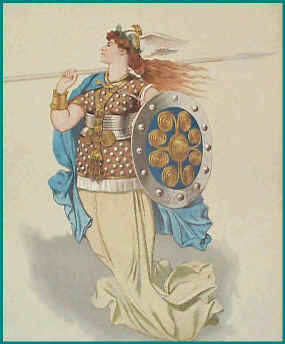 Valkyries were also viewed as priestesses of the Norse goddess of fertility, Freya. As their chief, she was sometimes called Val-Freya. The Norns, the three who spin, measure and cut off the lives of men compose, along with their sister-craftswomen, the valkyries, a class of beings called the Dis. They are kinswomen; the weavers of the web of war are called 'Herjan's Disir' and the spinster Norns called Gunn, Rota and Skuld, are the 'southern Disir'. In the second act of what is one of the oldest (1841) of the classical ballets, Giselle, the spirits of betrayed young women called willis, at the command of their ruthless queen, Myrta, attempt to induce the devious nobleman who seduced the heroine, to dance to his death. The word willis seems related to the Slavic for holy woman [vala] which may in turn come from vilasa, the Sanskrit word for the bliss dispensed by apsaras, the heavenly nymphs of Hindu mythology mentioned above. However, they can give you the willies! Most of what we know of the religion of the Indo-European peoples who became the Norse comes to us from the Bishop of Iceland, Snorri Sturluson, who wrote in the 13th century. Allowing for his biased though empathic view, and for all the varied factors that contribute to transformation in mythology, belief, custom and religion, there seems no question that the valkyrie and the dakini share a common origin. We can accurately call Valkyrie, pre-Buddhist dakinis. SkyWoman's name reminds us of sky-goer that is, dakini, but her personal name, Iotsitsisen means "flower in full bloom." She figures importantly in the mythology of the Iroquois [Haudenosaunee] and shares some characteristics of the dakini of the highest order: the Creator. Her myths were collected and retold for children in Shenandoah and George's Skywoman: Legends of the Iroquois. Sante Fe, NM: Clear Light Publishers, 1998. However she, as well as Spider Woman of the Hopi people of the Southwest United States who sings as she weaves the world into being, are generally considered to be goddesses. The distinction is often a fine and difficult one.